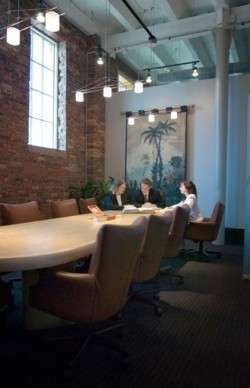 Our Tampa, Florida Law Firm Facilities | Swope, Rodante P.A. At Swope Rodante, we recognize that our ability to successfully protect our clients hinges on our ability to go to battle against the biggest and most powerful opponents. Withstanding long and expensive litigation, finding pivotal evidence and interviewing expert witnesses are all important components of the legal process that require significant resources. 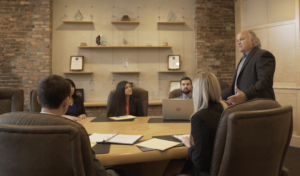 Our firm has both the resources and technology to go head to head with the most challenging of opposing counsels and to bring a case to life in front of a jury. Our state of the art facilities allow us to prepare for our time in the court room. Our office is in Tampa, Florida and we maintain a staff of about 50 members–including attorneys, paralegals, caseworkers and consultants. While our facilities are impressive, our legal team is by far our most valuable resource. Each member of our team has been selected to play a specific and unique role in our overall strategy in order to maximize results and efficiency. In an increasingly interconnected world, it is important for us to reach clients and expert witnesses all over the country with short notice. We honor the time of our clients and colleagues and it is important to us that we don’t spend valuable time in airports, contending with long lines and commercial airline delays. We maintain a firm aircraft and employ a full time pilot to increase our efficiency. With this investment, comes the peace of mind that no corner of the country, piece of evidence, or client in need is beyond our reach. As experienced trial lawyers, we are proud of the results we have been able to achieve for clients in the court room. A large part of our success can be attributed to our meticulous preparation. Countless hours are spent preparing for trial. Our mock trial room was built with the sole purpose of enabling us to achieve better results for our clients. Before a case is brought to trial, our attorneys will utilize our mock trial room to prepare witnesses to present in front of a mock jury, and to hone our overall strategy to be executed in the court room. Our firm has around the clock access to an in house video and graphic production department which allows us create state of the art exhibits, presentations and professionally produced settlement demand and day in the life videos for our clients.